Full-Service US Foundry - Columbia Steel Casting Co., Inc.
We’re proud to be an American, full-service steel foundry. Foundry engineering, molding and coremaking are critically important to making high integrity castings with longer wear life. Our system of rigging for gates and risers ensures better planning and optimum quality. It lays the crucial foundation for efficient production. Columbia Steel’s sand molding capabilities have been designed to handle a full range of castings, from large one-off parts to high production medium and small size castings. Larger molds are made quickly with high velocity sand slingers. Short run parts are produced on a molding line using rollover machines, and high volume orders are handled on our semi-automatic lines. A separate coremaking facility and automated sand system further ensures efficiency. 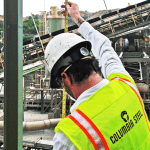 And Columbia Steel is committed to reuse and reclamation: our no-bake reclaimers process many tons per hour of reclaimed olivine molding sand. After cleaning, the sand receives moisture and bonding agents in a computer controlled system. The result is more consistent sand properties for higher mold and casting quality. Our fully equipped in-house pattern shop makes us unique among today’s domestic foundries. Translating engineering concepts into foundry-ready reality is the work of Columbia’s patternmakers. These craftspeople do more than shape wood and plastic—they carefully consider a wide variety of production issues, from alloys to shrinkage rates, from machining tolerances to cores for complex hollow parts. The sheer size of our products is a special challenge, requiring large woodworking equipment and attention to structural and dimensional concerns. The success of our pattern shop can be measured in part by the tremendous volume of patterns stored on site: currently over 24,000, with as many as 2,000 designs added each year. Our facility devotes 115,000 square feet to warehousing these ready-to-use and customizable pieces. Whether using an existing pattern, making changes to a pattern or producing a new one, our in-house pattern shop assures shorter lead times and consistent quality parts for our customers.